The modern scythe is a very safe tool to use – when you’re mowing with it. With a grip in each hand, it’s difficult to bring the blade anywhere near yourself, though easy enough to nip someone else’s heels. In addition, it’s light weight and manoeuvrability make it ideal for use in tricky corners or where the ground is uneven. However, the blade should be razor sharp and it’s once you stop mowing and begin to work directly with the blade that the dangers appear. The most common of these is when sharpening in the field with a whetstone and I have heard of many beginners and experienced mowers alike cutting themselves when sharpening, sometimes very seriously. The classice stance for sharpening is to be upright with the blade in front of yourself. The right hand whets the blade alternating back and front while the left hand moves the blade from right to left across your field of vision. Here’s where the problem starts: there’s too many things moving at once in close proximity. On my courses I teach a much safer method of sharpening based on kneeling down with the point of the blade in the ground and the snath held stable against the body. With the scythe still you can then safely sharpen with just your right hand and the whetstone working. I show beginners the best way to hold the stone for comfort and safety and we work slowly, concentrating on achieving a fine edge. An additional advantage of this method is that you are in position to look down on the edge and see what they’re doing without the view being obstructed by their hand and the stone. 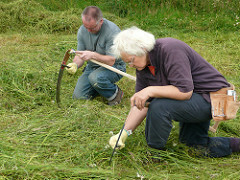 This is Grant & Lorna sharpening during my mowing course on the Black Isle, Scotland. As an extra safety measure I now provide cutproof kevlar gloves for the students to wear while sharpening which are light enough not to be cumbersome and I’d recommend their use to other scythe teachers. This entry was posted in Sharpening & peening and tagged kevlar glove, scythe, sharpening, whetstone. Bookmark the permalink.